I have written about Katie Granju before. This mother of five lost her eldest son in May to a beating and subsequent overdose. Her documentation of his struggle and her grief are heartbreaking. Today would have been this lovely boy's 19th birthday. She mourns him and the life that he should have had. And today, her family asked all her loyal readers to go perform an act of kindness. 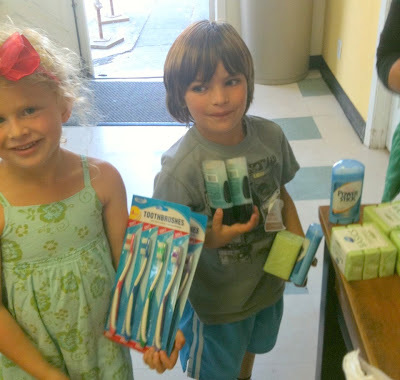 So in honor of Henry my friend S and I, along with our two five year olds, gathered canned goods, other foods and toiletries and took them to our local low-income and homeless center in our county. It was a first for Lilly and her little friend L as well. When I told Lilly what we were doing she was truly confused. I explained that there were people in our own county that didn't have enough money to eat. I explained that some families just can't afford toothpaste and soap. The four of us took our bags of donations and gave them to the center. Lilly and her friend L were in awe. This will now become a monthly Act of Kindness. We didn't make a dent, but at least we did something. I am putting a call out to all my readers. Go do something for someone besides yourself today. It could be as small as letting a car go in front of you when you would normally speed up to be first. You could engage a senior citizen in a conversation. You could pick up trash along the road while out walking your dog. Do something. Today do it in honor of Henry. Next time do it because it is the right thing to do. I will write the next installment of "The people I love the most" on Sunday. Off to a wedding for the weekend! You make me a better person friend! Grateful to have you and your family! Well, you can count me in! Sometimes you get so involved in your own lives you forget how many are desperatley in need of the basic things that we take for granted.Great blog! Good job, both on the blog and your kindness! An Act of Kindness, Today, and everyday! Easy to do, and it would make this a better world! Count me in.